New skylights and finishes that withstand extreme climate re-establish Royal Hawaiian Center as a premier shopping destination in the Island. Earlier this summer, Waikiki’s Royal Hawaiian Center finished a multiyear, multibuilding renovation. With more than 110 shops and restaurants across a trio of four-story buildings, the 28,800-m2 (310,000-sf) center is one of the state’s largest shopping malls. Designed in a Brutalist Modern style and established in 1979, it stands upon a parcel of land known as Helumoa, once home to Hawaiian royalty. Exterior walls, heavy in concrete, defined the structure with little embellishment or connection to the environment and community. Increasing vacancies and declining visitors forced the owner, RHC Property Holdings, to renovate and expand the center. The first phase of the $115-million project began in 2005. Design consultancy CallisonRTKL took the initial steps to transform a dark, outdated shopping center into a vibrant, lifestyle-oriented retail and entertainment community. The heavy walls were replaced by open, modern façades and native landscaping. The mall’s refreshed exterior, which includes a green gathering space for entertainment and cultural programming, seamlessly blends with its lush surroundings. 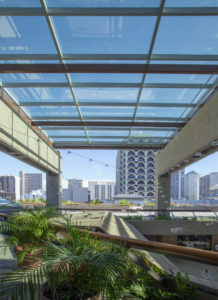 Skylight systems were installed in Buildings A and C—designed by Architects Hawaii (AHL)—to showcase natural light. The skylight system on Building A has electrochromic (EC) architectural glass, which transitions through multiple tint states to control the sun’s energy for optimal natural light and thermal comfort. A 15 x 30-m (50 x 100-ft) single-slope glazing system makes the space open and welcoming. A 6 x 6-m (20 x 20-ft) pyramid canopy glazing system was also installed on Building C in 2014. The skylight’s aluminum framing members were painted in a durable, 70 percent polyvinylidene difluoride (PVDF) resin-based coating to protect against the intense sunlight, heavy rains, high humidity, and salt spray—a given in coastal environments. The coatings meet stringent industry standards of American Architectural Manufacturers Association (AAMA) 2605-13, Voluntary Specification, Performance Requirements, and Test Procedures for Superior-performing Organic Coatings on Aluminum Extrusions and Panels. In addition to resisting corrosion, these high-performance finishes were tested for proven resilience against water, salt spray, humidity, impact, chemicals, detergents, scratches, and fading caused by exposure to ultraviolet (UV) light. The coatings were applied in a controlled facility to destroy volatile organic compounds (VOCs), usually present in liquid solvent-based paints. The aluminum can be recycled after its useful lifespan. Finished aluminum is also fire-retardant and does not swell, rot, warp, or attract insects. AHL used its expertise in Hawaiian culture to create a place consistent with the City and County of Honolulu’s Waikiki Special Design District guidelines. According to the firm, the design strives to incorporate historical, cultural, and educational features consistent with the goal of Kamehameha Schools to “perpetuate all things Hawaiian.” Additionally, visual and pedestrian linkages with the adjoining Sheraton Waikiki and Royal Hawaiian hotels were improved. The renovation has earned the property accolades ranging from the American Institute of Architects (AIA) Honolulu Chapter’s Award of Merit to the General Contractors Association (GCA) of Hawaii’s Build Hawaii Honorable Mention. Sales have increased in the mall, which now hosts the largest concentration of flagship and locally owned stores in Hawaii. The local culture is celebrated every day with a variety of cultural activities such as hula instruction, lauhala weaving, lei-making, ukulele classes, and live entertainment.